The kit is easily loading and unloading, multifunctional and recycled, which makes you comfortable and relaxed and bring you user-friendly experience. Leather wallet holds the screwdrivers, portable and not easy to drop. High-end leather keeps screwdrivers away from loosing and falling. 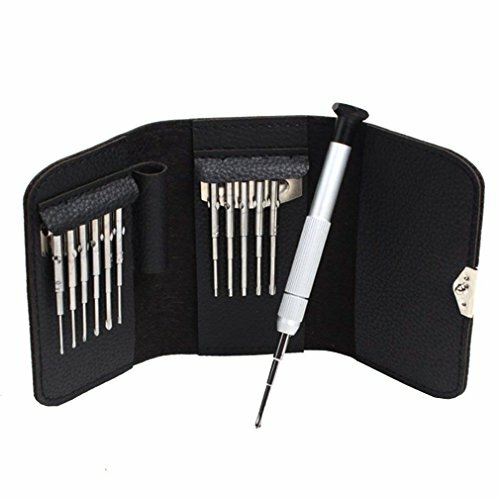 Screwdriver set repair kit with pocketable leather wallet style packaging, easy to carry and use and not easily scattered and broken. And the bag design can avoid parts missing. And you even put your card in it. It is a reasonable and humanized product. The kit is made of CRV Alloy Steel. It has the performance of high hardness and good toughness, which make the kit more sturdy and durable. And this kind of material of CRV Steel makes the parts of kit more light and convenient. The hand grip adopt anti-slip design to improve the work efficiency. Every screwdriver head add the magnetism to avoid the small screws and other parts missing. And the black tail cap can rotate flexibly, the chuck fix screwdriver firmly in the head. The kit has 12 different specification heads to solve the problem of insufficient tool. If you have any questions about this product by Yifant, contact us by completing and submitting the form below. If you are looking for a specif part number, please include it with your message.